After years of anticipation, I finally stood at the end of an allée of horse chestnut trees and beheld Schloss Moritzburg. Duke Moritz of Saxony built this hunting lodge on an artificial island in a marshy region just north of Dresden, Germany in 1542. Augustus the Strong improved upon it in the 1720s, creating a distinctive square building with four cylindrical towers that is surrounded by a park, a pheasant farm, and a hunting ground. Before I began my walk to the island, I admired two milestone columns dating from 1730 that are marked with the Saxon coat of arms. 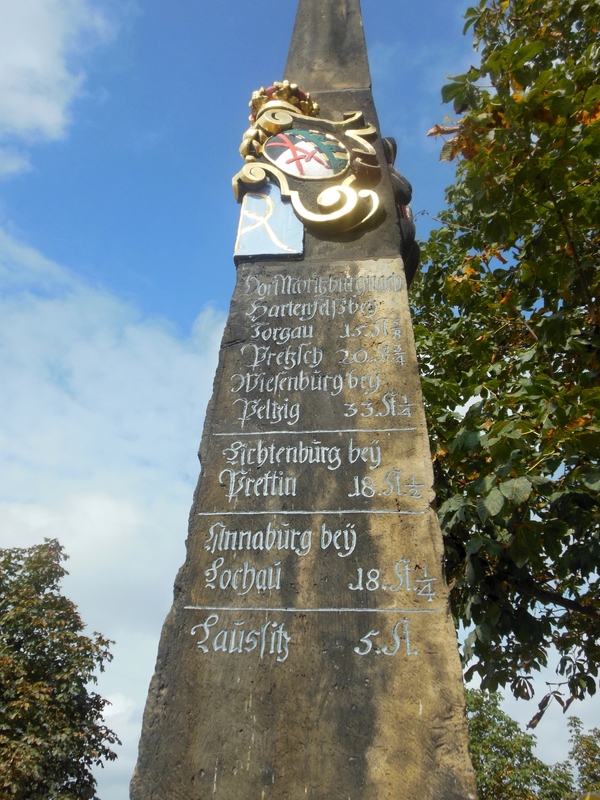 The columns give destination distances from Moritzburg that are based on travel by horse-drawn carriages. 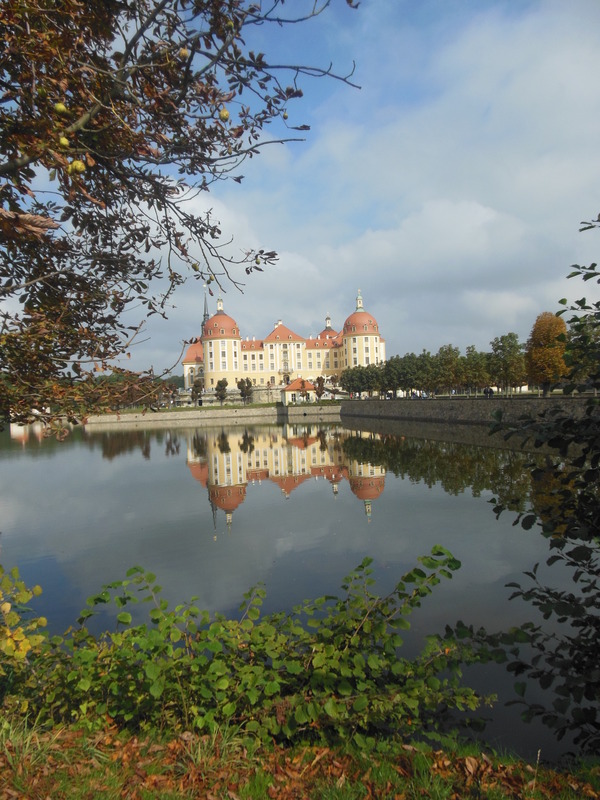 When I reached Moritzburg, I climbed a few flights of steps and took in amazing, impressive sights. Chinese lacquered furniture, silver furniture styled after that at Versailles, porcelain from Japan and Meissen, and original leather wallhangings that were either painted, covered with silver leaf, embossed, or chased with hot metal dies. Paintings of hunting parties at Moritzburg record details of spectacular affairs where guests took boat rides on the surrounding lake, played cards, ate ice cream, watched fireworks displays and parades of Moors and exotic animals, and shot animals that were either tethered or enclosed so they could not get away. Moritzburg is known for its outstanding collection of hunting trophies that line the walls of several rooms. Gilded or carved wooden representations of deer heads are topped by antlers from elk, moose from northern Europe, reindeer, and a giant stag from the Ice Age that Tsar Peter I gave as a present when he visited in 1698. In Diana’s Hall, also known as the Monstrosity Room, I counted 39 pairs of antlers that were misshapen by diseases or injuries. The dining room has 71 trophies, between 270 and 400 years old, which were either purchased or acquired as presents. Among them is the heaviest set of red deer antlers in the world, weighing over 40 pounds and spanning over six feet. The most extraordinary sight at Moritzburg may be the Feather Room. In 1720, Augustus the Strong saw an advertisement in a Parisian magazine for a featherbed made by Monsieur Le Normand, a Frenchman living in London. To make this unique piece of decorative art, over one million peacock, pheasant, guinea hen and duck feathers were dyed and knotted on a core thread at set intervals. This created a soft, fluffy surface of feathers that was cut to form patterns and coated with glue to create overlaps like roofing tiles. Augustus the Strong bought the featherbed for his Japanese Palace in Dresden, but he removed the canopy and used the curtains as decorative textile panels for the room where the bed was installed. He also intended to display over 900 pieces of porcelain in his feather room, but limited the furnishings to lacquered tables and a grandfather clock. 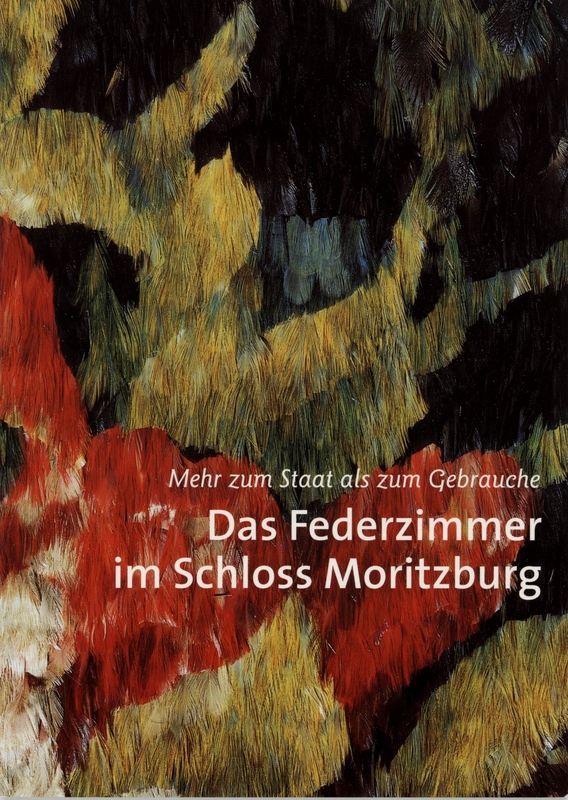 In 1830, the feather room was taken to Moritzburg, where it remained on view until 1972. From 1982 to 2003, it was restored to correct damage from unfiltered light and pest infestation on the wood paneling. Each of the feathers was housed in a nitrogen chamber for four weeks to protect against pest infestation. Then, they were cleaned in a special water bath, dried separately using tweezers and a strong stream of cold air, and then were combed and fastened with threads to a loom. The results of the award-winning conservation project are on display again in a separate exhibition area at Moritzburg. This entry was posted in Art, Germany, History, Special Collections, Travel. Bookmark the permalink.